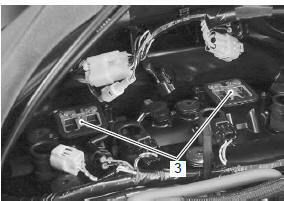 Remove the pair control solenoid valve (1) along with the pair reed valve covers (2). Refer to “pair control solenoid valve removal and installation” . Remove the pair reed valves (3). 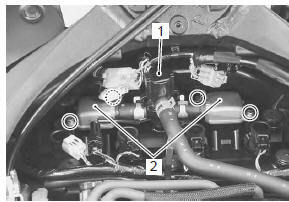 apply thread lock to the pair reed valve cover bolts and tighten them to the specified torque.